Rome houses not only some of the finest works of sculpture in Italy, but many of the most important pieces of sculptural art in the entire Western world. Not only do Rome's museums and churches contain impressive collections of ancient Greek and Roman sculpture, but they also possess works by such notable Renaissance and Baroque artists as Michelangelo Buonarroti and Gian Lorenzo Bernini. 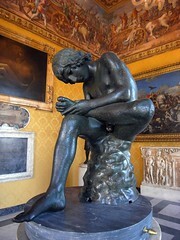 To travel to Rome and see these works is to discover an entirely new appreciation for sculpture as an art form. The following list points out ten of the most impressive, important sculptures to be found in the Rome, Italy. Although there is a seemingly endless number of sites to see and places to visit in "The Eternal City," one should be sure not to miss any of the works of art listed here. 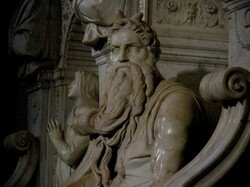 Image above: A close-up of Michelangelo's "Moses" in Rome. Photo by the author, sockii. This odd piece of bronze sculpture is notable for its importance in Roman history. It portrays the animal symbol of Rome, the She-Wolf, and the story of the city's founding. According to legend, Rome was founded when the twins Romulus and Remus were cast into the Tiber river, after their father Numitor was overthrown. The twins were rescued by a female wolf, who tended to them and even nursed them until they were found by a herdsman. The She-Wolf sculpture is believed to be an Etruscan piece dating from the 5th century BC, with the figures of the twins added at a later date by another artist, hence the differing styles of execution. Some controversy surrounds the exact origins of the piece, but whatever its age, it is worth seeing as a work so loved by the Ancient Romans. 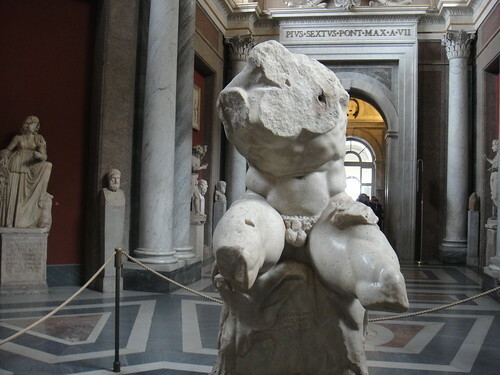 This sculpture was discovered in the gardens of Villa Ludovisi in Rome and dates to the 3rd century BC. It is a touching, beautifully executed piece depicting a wounded Celtic warrior, with many fine details adding to the air of realism. It is actually a Roman copy in marble of a lost Hellenic sculpture, which may have been created by Epigonus. The viewer can almost feel the soldier's pain, yet there is a peace and somber nobility to the figure as he prepares to face his death. 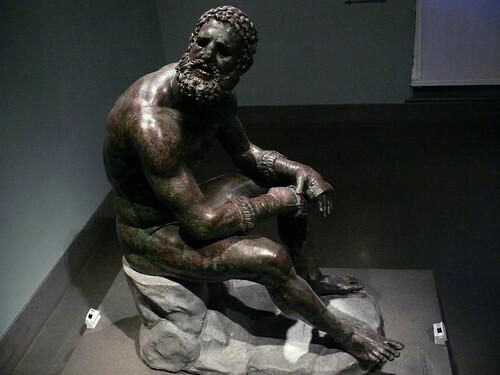 Also known as the "Boxer at Rest," this exceptionally well-preserved bronze is a Hellenistic Greek work dating from the 1st century BC. It is one of two bronzes unearthed from the slopes of the Quirinal in 1885 and is striking for its realism, including details such as a broken nose and many scars. As one nears the sculpture, it seems as though the boxer could come to life at any moment, prepared to re-enter the ring and fight. This Greco-Roman bronze sculpture of a boy carefully removing a thorn from his foot is one of the few Roman bronzes never lost to sight. Early Renaissance artists held it in high regard and produced numerous copies, making it a still-iconic image today. Its exact age is unknown, with various studies dating it anywhere from the 1st to 5th century BC. Regardless of its age, however, the image is still compelling for its realistic imagery and unique subject matter. Bernini's work can be seen throughout Rome, but some of the best examples of his sculpture can be found in the Villa Borghese collection. It includes this amazing piece, created by Bernini between 1621-1622 when he was only 23 years old. It is meant to be viewed from all sides as the two figures, Pluto and Prosperina, are engaged in a twisting, violent struggle and he prepares to triumphantly carry her off to the Underworld. Bernini's mastery over marble is evident in the power he brings to this work, from the way Pluto's hands press into her marble "flesh" to the contrast between his muscular form and her delicateness. Another stunning Bernini in the Borghese collection is this representation of the story of how Daphne escaped Apollo by transforming into a bay tree. It was completed circa 1622-1626. Not only does the sculpture convey a clear sense of swift movement and action, but the fine detailing in the marble work is extraordinary. Bark is beginning to creep up Daphne's legs as her blowing hair transforms into branches and leaves. This sculpture will leave the viewer in awe of both its beauty, and the skill of the artist who created it. One feels as though it could come to life at any instant. Celebrates the life and work of the Italian Baroque period painter, architect, and sculptor. This is an impressive monumental sculpture showing the Trojan priest Laocoön struggling to save his sons Antiphantes and Thymbraeus from being strangled by sea serpents. Likely the sculpture was commissioned by a wealthy Roman for his home, and was unearthed in 1506 near the Domus Aurea of the Emperor Nero. Its discovery had a great influence on the artists working in Rome at the time, most notably Michelangelo who was impressed by its scale and the sensuality of the figures. It is viewed as a high ideal of art for the way it juxtaposes such beauty and nobility with a tragic scene of death. This masterpiece of Renaissance sculpture is part of the tomb of Pope Julius II, and was completed circa 1513-1515. Moses is depicted here with horns on his head, which at the time was a standard symbol of wisdom and enlightenment. The figure is striking for the tension emanating from his body, from the intent gaze directed to the side and the legs poised for movement. One imagines the figure is ready to rise and leap into action at any time. Be sure to bring some Euro coins with you to turn on the light box in the church, to see the full majestic details of this sculpture. 2. The Belvedere Torso, "Apollonion son of Nestor"
This fragment of an Athenian sculpture is notable for its importance to many artists of the late Renaissance period and beyond. 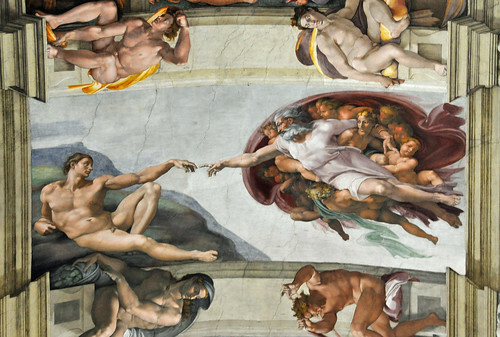 It is considered a catalyst of the classical revival, as Michelangelo is said to have studied it intently, and used the sculpture as inspiration for many of the figures in the Sistine Chapel. Dating from the first or second century BC, artists have marveled through the ages at the detailing of the musculature and the twisting, contorted pose. Much Baroque and Mannerist painting and sculpture followed in this style. This sculpture dating from 1499 is one of Michelangelo's most famous works, after the David and the Sistine Chapel. 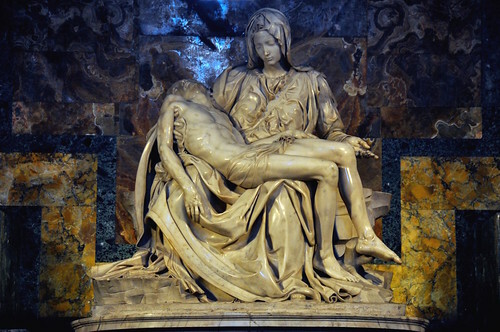 Although he actually completed several different versions of the Pietà, this one at the Vatican is the most well-known throughout the world. It is beloved for its finely finished detailing, and for perfectly balancing naturalism with Renaissance ideals of classical beauty. There are many interpretations and theories about the work, which is unique in depicting a very youthful and serene Mary, much as she is typically depicted in images of her with the newborn, infant Jesus. One theory is that the piece is meant to show a young Mary having a vision of the future, hence her youth while holding the dead, adult Jesus. The power of the image has driven some to disturbing lengths, such as when, in 1972, a mentally deranged man took a geological hammer to the work and attacked it while shouting, "I am Jesus Christ." As an unfortunate result, the sculpture is now blocked from the public by bullet-proof acrylic glass, which diminishes its impact on the viewer to some degree. Even so, it remains one of the most impressive and important works of sculptural art for visitors to see in Rome. * Guides, Knopf. Knopf Guide: Rome. Oxford Oxfordshire: Oxford University Press, 2005. * Dying Gaul - Wikipedia. Lovely sculptures they are. I've had the pleasure of seeing a few of them in person.